In order to shed more light on my post titled “The Creo Product Strategy“, Mike Campbell, PTC’s DVP of Creo Product Development, sent me an email containing the following clarification. What about CoCreate (or Creo elements/direct)? 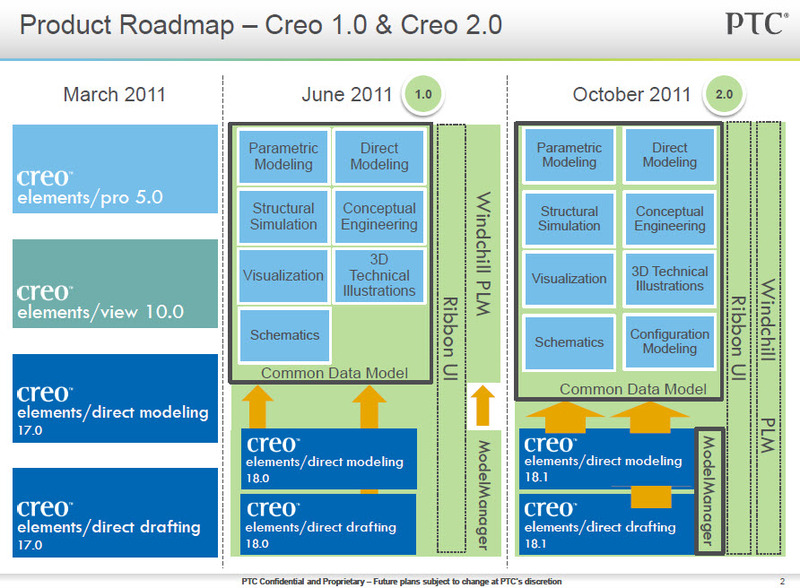 The reason for this is that the Creo elements/direct product capabilities are quite broad, and it will take us a while to completely map all of those capabilities, and the associated data, to the new Creo Common Data Model. Not only does Creo elements/direct provide Direct Modeling, including parts, Assemblies and Sheetmetal parts, but there is support for FEA, Moldbase design, routed systems, and so on. In order to continue to improve those products, and incorporate the changes needed to accommodate that data compatibility, we will continue providing new releases of Creo elements/direct. These new releases of Creo elements/direct will include the new top-level Ribbon UI, consistent with the rest of Creo, as well as improvements around Windchill PDMLink integration and other functional enhancements to the products. We will also be focusing quite heavily on supporting the 100% compatibility of data and working methods that we have committed to for Creo elements/direct customers. On the slide, you will notice orange arrows, indicating the ability to move some data seamlessly (initially, geometry, and geometric meta-data, such as thread definitions, for example), and then broader arrows in the future (at 18.1) indicating more and more application-specific meta data will be compatible with Creo. The details of exactly what Creo elements/direct capabilities and meta-data will be seamlessly accommodated in Creo are yet to be determined, but this will likely be a multi-release process. We expect that some customers will find the capabilities acceptable to them, and will be able to move to Creo in the first and second Creo releases, while others, with more sophisticated use of Creo elements/direct may want to wait until that “bridge” is wider, and more of their data can seamless move to the new platform. We have no plans to sunset Creo elements/direct at this time, and expect a 19.0 and 20.0 release and so on. Mike also asked me to note that these are the plans for CoCreate as of today. He wrote to me, “They reflect our current plans, but these plans are of course subject to change“.